I can’t believe it is the end of August. Boy, the summer just flew by. And here we are going into Labor day weekend. At least my youngest two will be home for the long weekend. And on Saturday we are going to see……HAMILTON!! I have been looking forward to this coming to Minneapolis for over a year. And I was fortunate to be able to get tickets for the four of us to go! Eeeeek! (I’m just a little bit excited.) I am not throwin’ away my shot! The card base is embossed with the Subtle 3D Dynamic Textured Impressions Embossing Folder. The striped layer is from the Twinkle Twinkle designer series paper pack. For the flower panel, I stamped the flowers from Perennial Birthday in Gray Granite. Next I colored them with my Stampin’ Blends in Flirty Flamingo and Granny Apple Green (the lighter shade). Then I grabbed my Light Pool Party Stampin’ Blend and colored the background. Ta Da – I made my own DSP!!!! I embossed the greeting in white on a piece of Gray Granite card stock and adhered it to the card. So easy! 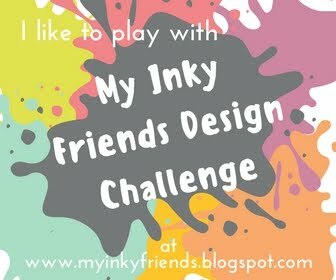 Have you tried coloring with Stampin’ Blends yet? You really need to. They are fabulous! Hey, I just realized my manicure even coordinates with this card! That’s a wrap for today. Thanks for stopping by. Come back soon and join me in putting a spotlight on creativity!